We make it easy for you to schedule, invoice and manage your electrician business. Use an electrician scheduling software that makes work in the field much easier, while increasing sales. Grow Your Electrician Business with Workiz! Managing all of your electrician jobs, invoices, and estimates can be a hassle! 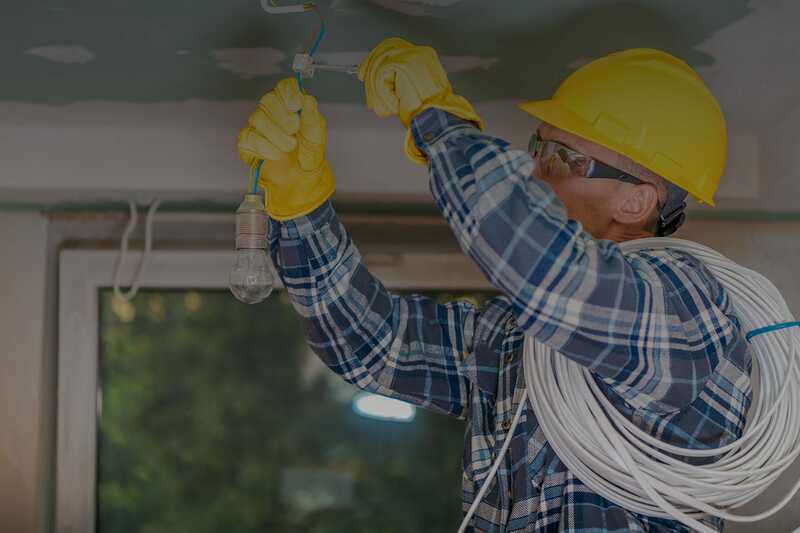 Your electrician business is always on the move, so is Workiz. Stand out from your competitors by being prompt and reliable. Missing an appointment or showing up late can mean a lost opportunity for a repeat customer. 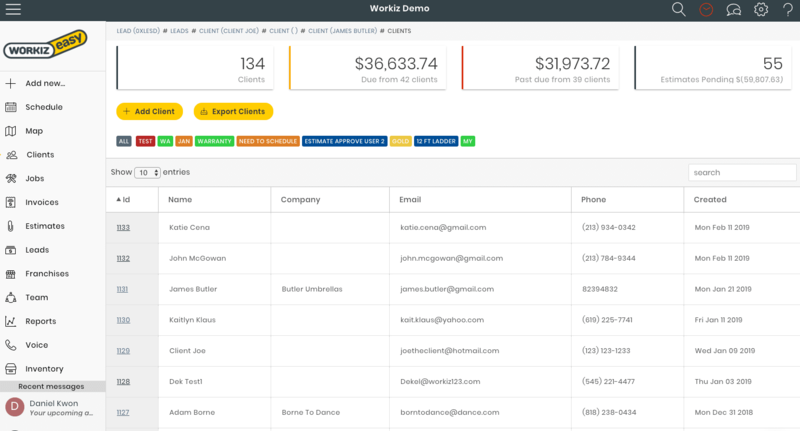 Take control of your schedule with Workiz. Easily enter new jobs and view the schedule to fill available time slots. Drag-and-drop to make quick changes by day, time or technician. Send appointment reminders to technicians and customers, including confirmation requests to keep the schedule up-to-date. Make sure your technician knows if special tools or equipment will be required. Sync the schedule to your favorite calendar application, or access Workiz from any device with an internet connection. 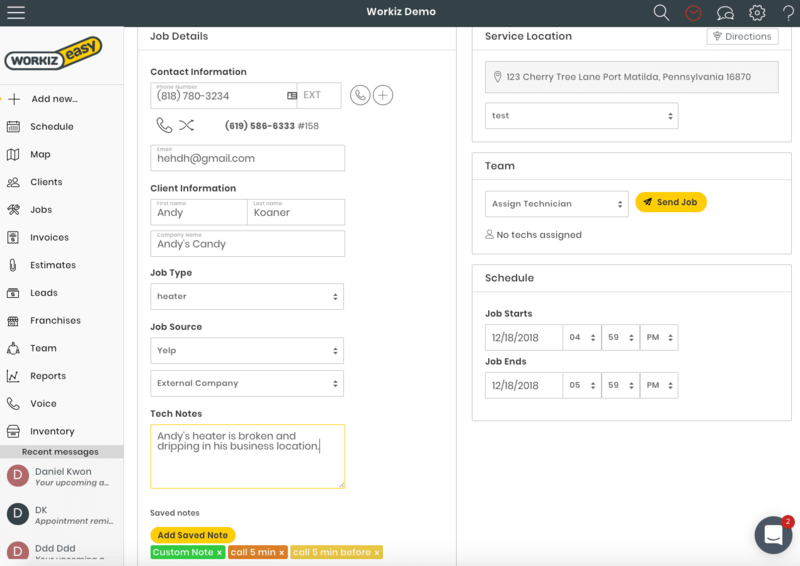 With Workiz, you will be able to add extra information (or custom fields) to new jobs. Your dispatcher can note any specific details that the electrician needs to know before the job. You have complete control over what information you want the dispatcher or manager to take down when creating jobs, as a required field. This is just one example of how custom fields can help you manage your electrician business. Our system is perfect for keeping your electrician clients up-to-date on their job statuses. Create custom SMS and/or email notifications for your clients for scheduled work. Send email confirmations to clients, and when confirmed it automatically updates in Workiz that they’ve confirmed. Keep records of past invoices, phone calls, and much, much, more. Impress your clients with this professional electrician management tool. Tired of accounts being overdue by 30, 90 or even 120 days? It couldn’t be easier to get paid and keep your accounts updated! Make it easy for clients to pay you right when you finish the job. Update the invoice with actual services performed and parts used. Collect an electronic signature and attach photos to the job information and send your clients an invoice from any device. Clients are able to pay when the work is done, and you can accept credit cards payments from out in the field when you have your payment gateway integrated with Workiz. Enter the payment information and then sync with your Quickbooks. What's a Electrician Scheduling Software? An electrician scheduling software is a web or mobile app that helps you run your service business more efficiently. You can use such an app or software from anywhere that has an active internet connection to check your leads, schedule, view your client’s history and create invoices. Basically, everything that you used to write down on paper or keep in a spreadsheet can now be more efficiently managed in an electrician scheduling software. How Can an Electrician Software Help My Bottom Line? The same way as you always did with a few additions. When you receive a cash or check payment from a client you can easily add the payment to Workiz. You can now charge your client’s credit card using the web and mobile app.